The leafy suburb of Chorlton seems like a fitting location for a passive house project that looks to have broken new ground in a number of exciting ways. Well known as the liberal heartland of Manchester, Chorlton is sometimes derided for being a bit too bohemian/lefty/middleclass for its own good, but if that’s the price to pay for being the location of what may well be the most sustainable passive house retrofit ever carried out on a period property, then so be it. A pair of semi-detached Victorian townhouses on Zetland Road in the soughtafter M21 postcode have been retrofitted not just to the Enerphit standard — the passive house benchmark for retrofit projects — but to Enerphit ‘Plus’, which is awarded to buildings that also generate at least 60 kilowatt hours in renewable energy each year per square metre of floor area. But besides being the first Enerphit Plus project in the world, its developer also took a vastly ambitious approach to reducing the overall carbon footprint and environmental impact of the build. For a start, the building fabric contains practically no petrochemicals, all the materials and construction details are fully breathable, the dwellings still sit on their original footprints, and almost all 200 tonnes of brick in the property as well as all the original joists and rafters are still in place. “It’s keeping the embodied energy, the embodied carbon that was put in there when it was originally built… keeping that on site,” says its developer, Kit Knowles. And while this magazine has featured various projects over the years that roughly fit that description, many of which were important milestones in demonstrating just how dramatically you can improve the thermal performance of historic dwellings, Knowles’s approach was markedly different. A chemical engineer by training, Knowles now runs Ecospheric Windows & Doors Ltd, a consultancy specialising in sustainable construction, and which also supplies high performance timber windows. His CV includes stints with BP and pharma giant AstraZeneca but underpinning a lot of his work for those firms was a zeal for integration engineering. This, together with the fact that he comes from a family of architects (both his parents, a cousin and a sister) — who would frequently talk about how new energy-efficiency technologies were being “strapped” onto houses without any thought about how well they worked together — provided him with the initial spark to build an expertise in sustainable building. Ten years ago, Knowles and his wife Ellie deep retrofitted their own 100-year old Arts-and-Crafts style semi-detached home in Chorltonville into a ‘SuperHome’, a UK standard that requires homeowners to cut their dwelling’s carbon emissions by 60% (they achieved 81%) and then open its doors once a year to the public. His philosophy was to make every layer in the walls, roof and floor highly breathable. Knowles says that the project was “kind of a laboratory”, featuring test-bed technologies like hybrid heat recovery with passive stack ventilation, the first use of Spacetherm aerogel external wall insulation, hybrid solar PV-thermal panels, and a solar-powered rainwater harvesting system. For this project, he was keen to focus on the type of domestic property categorised by the British government as ‘hard to treat’, which constitute around one third of the 24 million homes in the UK. After an extensive search, Ecospheric bought Ingleside and Woodleigh in 2016, two adjoining semi-Ds on Zetland Road that were for sale as one unit. Built in 1894, the four-storey townhouses (including basements) were bought from a landlord’s portfolio and had been sub-divided into five separate apartments across the two buildings. They were in a poor state. Knowles says the firm initially wasn’t planning to go as far as it did with the project, but their confidence grew when the housing market started shifting strongly in an upward direction, prompting them to be more ambitious about the engineering behind it. The finished houses are stunning to look at, inside and out. The front façade looks suitably traditional, featuring what Knowles believes are the first stained glass external windows used in a passive house project. 1 The team preserved the original 175mm deep floor joists, which were insulated with cellulose, with Steico Protect Dry woodfibre insulation below the joists; and 2 an Intello or Siga airtightness and vapour control membrane above. The windows were developed by Ecospheric Windows & Doors Ltd and their manufacturing partner, Viking, after extensive surveys of traditional stained-glass patterns in the area. At the west-facing timber-clad rear of the buildings, the first-floor windows are angled southward to maximise solar gains. In fact, the rear wall at ground floor level was the only external part of the building to be altered structurally, with the removal of the external brickwork. The large new glazed elements here left so little original brickwork behind that it was no longer structurally viable. 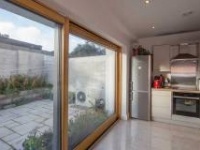 Knowles was conscious of the risk of overheating, but at Zetland Road the solution was to “keep the brick fully connected to the space within the property” in order to exploit its high thermal mass, that is, its ability to smooth out internal temperatures by absorbing and slowly releasing heat. So, on most internal walls the brickwork was simply parged with lime — which also provides thermal mass — and left exposed to the interior. Meanwhile, the exterior is clad in Organowood, a Swedish wood product distributed in the UK by sustainable wood specialists Ecochoice, which takes a novel, inert, approach to wood preservation: fossilisation. Bekin explains that Organowood’s unique patent-protected process involves disolving the silica onto the wood, and then letting it harden once inside the wood. The rear façade also has rainwater goods and coping made of copper with a claimed 120-year lifespan, while a whopping 60 square metre array of solar photovoltaic panels on the roof generates an average annual output of 8,740 kWh. The walls of the houses are solid brick, and in places a second inner leaf of brick was removed. The side walls were externally insulated using Steico’s FSC-certified timber I-joists, which were insulated with cellulose, covered with wood-fibre, and finished in lime. The internal insulation to the front façade is again comprised of Steico’s timber I-joists, blown cellulose and wood-fibre board — but with a 38mm ventilated cavity between the old brickwork and the new insulated layer. Inside, the walls throughout the house were parged in lime and painted with Graphenstone paint, made from a combination of graphene and lime that claims to be truly crack-proof. Describing construction’s fight against moisture ingress as the “blackest of black arts”, Knowles was keen to ensure that all the walls and construction details were genuinely breathable and diffusible. 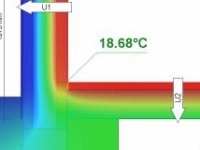 While a common approach in construction is to have a gradient of breathability across a wall, Knowles say this often results in an interior layer that restricts the movement of moisture. 6 Adjoining the old brick party walls, the rear ground floor was the only part of the house where entirely new walls were constructed, again built from Steico’s i-joist system. It may seem somewhat ironic that, for a project that aims to preserve as much of the building fabric as possible, Ecospheric ended up spending far more than it budgeted on the building fabric. However, part of this was clearly down to Zetland Road being a test-bed for a “breathable, organic, fabric-retaining solution” for passive house retrofits. The first area of overspend concerned the bay windows, which needed new foundations, as the original Victorian ones were very shallow and not designed to last 125 years. So, after looking at a lot of different options, the team decided on a kind of aerated bench block system that uses just a fifth of the amount of concrete compared with traditional systems. Another area of overspend was in trying to hone the use of lime-based products. Knowles is a “massive fan” of lime, namely because of its breathability, ability to sequester volatile organic compounds and carbon, buffer moisture, and prevent mould build-up thanks to its alkalinity. (above) Isokorb thermal breaks at both ends of a steel beam, to prevent thermal bridging where the timber A-frame is to adjoin the steel. 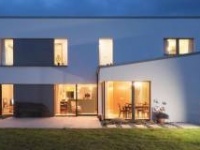 We’re certainly, I think, the first petrochemical-free passive house retrofit. However, the team spent long hours on site trying to achieve a finish with the lime that would have resembled the smooth gypsum plasterboards of the Victorian era. However, the use of graphene-enhanced lime paint should eliminate cracking in the finish, and Knowles says this will also greatly help with long term vapour control and airtightness. Meanwhile, Knowles is also proud of a solution he has developed that involves knocking out the front of a chimney, all the way up the three or four storeys of a typical Victorian building, to create a roomy cavity that houses all the services— including ventilation, heating and electrics. It means that the pipes for ventilation, for instance, can be much shorter than usual, improving overall performance and avoiding the need for exposed boxing, in keeping with the original Victorian interiors. In order to finance Ecospheric’s next project — a proposed zero waste and zero energy food hall in Levenshulme — Woodleigh is currently on the market for £925,000. The timing of this, not to mention budgets, restricted the extent of any continuous post-occupancy monitoring, which is currently fulfilled by a modest cloud-based temperature and humidity system. But Knowles says he is happy to facilitate any researchers eager to undertake more extensive study of the second property, Ingleside, which Ecospheric plan to use as its own office and show home. But being an Enerphit Plus, the energy bills for the properties should be practically zero (see ‘In detail’), and Ecospheric estimate that the water bills have been reduced from around £650 a year to £300. 7 & 8 installation & finishing details of the Viking triple-glazed aluclad windows. Knowles particularly likes the “crisp room shapes” and the floors in Woodleigh, which are the original pitch pine floorboards painstakingly re-laid in a chevron pattern. But above all he likes the total silence and tranquillity that descends when you step inside and shut the door behind you. 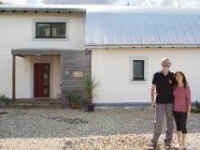 Can these Zetland Road houses perhaps claim to be the greenest passive house retrofits to date in the UK, if not the world? Indeed, given their success in retaining as much as possible of the 125-year old carbon embodied in the buildings, surely Ecospheric could reasonably hold Woodleigh and Ingleside up to be among the most sustainable passive houses currently in existence, in terms of energy and materials? “I couldn’t make that claim without more evidence,” responds Knowles, but adds that he is working on a high-level carbon analysis that the firm hopes will help it make some meaningful comparisons in that regard. Energy bills (estimate, per house): Total space heating demand of 2,346 kWh according to PHPP. This is to be met using a combination of wood burning stove & excess PV electricity to post heater in the MVHR system. Electricity demand of 2,039 kWh per year (PHPP). To be met from solar PV system & grid electricity. Hot Water of 1,864 kWh per year demand (PHPP). To be met from solar PV system & grid electricity. Biomass costs approximately £80 per cubic metre for unstacked logs. Assuming this amount is burnt each year, and each cubic metre provides 1,950 kWh (2,600 kWh burnt at 75% efficiency), remaining space heating demand after logs are burnt is 396 kWh, to be provided by electric post heater to MVHR system. Electricity consumption remaining for space heating, water heating & electrics is 4,299 kWh per year. The solar PV system generates 4,370 kwh per year, and assuming 80% utilisation & 20% export of this, the house uses 3,496 kWh solar electricity per year. This leaves 803 kWh per year required from the grid. The house’s Tonik renewable energy tariff is 12.68p per kWh plus a £73 standing charge, for an estimated annual electricity bill of £175. Adding the cost of biomass at £80, gives a total annual energy bill of £255. However, the house receives a renewable energy feed-in-tariff of £172 + £45 for 20% PV export to grid (£217). This leaves an annual energy bill of £37. In reality one cubic metre of wood could easily be sourced for free, which would leave an annual profit on energy costs of £43. Airtightness (at 50 Pascals): 0.9 ACH (working towards 0.6 currently) Please note there were 20 different U-values for opaque building elements on this project and the following are just some of the main elements. After: 2kW electric post heater on Paul Novus 300 MVHR system, DiBT accredited Wiking log burning stove. Domestic hot water electrically heated in Mixergy 300L tank. Electricity fed from PV on roof. Green materials: Wood fibre and cellulose (recycled newspaper) insulation; lime plaster/ render; timber frame hybrid construction; breathable magnesium construction boards; breathable flooring materials: Tuscan marble, hardwood; copper detailing for ultra-durable rainwater and coping goods; FSC certified hardwood cabinetry; Welsh slate kitchen worktops; CO2 absorbent lime-graphene paint by Graphenstone. Electricity: 60 square metre solar PV array across the two properties. Comprising 36 x 330-Watt Panasonic HIT modules over two systems. Each system being 18 modules, and with each module having a Tigo voltage optimiser connected to efficiently manage any shading effects, and to maximise the total output of the systems. The total installed capacity is 11.88kWp. Each 18-module system has been wired in two strings, one string of 11 modules (3.63kWp) and one string of 7 modules (2.31kWp). This configuration is to allow the later addition of on-site energy storage. A Solar IBoost water heater controller is also installed on each system. These controllers monitor the electricity consumption in the house and as soon as any of the PV generated electricity is not being used and begins to export, this PV electricity will be diverted into a circuit of choice. In Zetland Road this circuit of choice is an immersion heater in the hot water cylinder. As the two houses consume so little electrical energy, a large proportion of domestic hot water will be generated from using PV electricity. Bespoke timber & aluminium clad windows & doors delivered with expert technical support.